Upstate Escape Pt2: The Orchards. If I could escape ... New York City, may be the city "where dreams are made of", but as grand as it can be, it can be just as rough, to say the least. I frequently find myself with an urge to escape the madhouse of NYC, but especially in the Fall. Going Upstate is one of the best "things to do" during Autumn, but it is also all-too-easy to get up there. Ben and I have taken various excursions Upstate on our days off (which are on week days, a blessing in disguise, the overpacked way good places are in the metro area on weekends, no joke). I haven't driven regularly in over 6 years, since I moved from the 'burbs of Indiana, which is bad, for me, but taking the subway, train or taxi/car makes it easy to lose track. That said, the easiest way to travel up to the charming, scenic (did I mention peaceful?) Upstate NY attractions is to take a train via the Metro North railroad system - the ride itself is a foliage tour! Weather can be so hit-or-miss in the Fall, but thankfully, we had a couple of good travel days to see some new places. 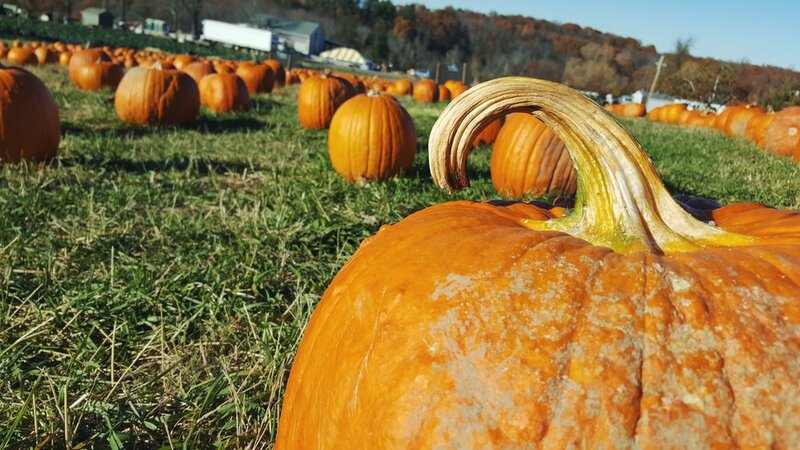 Outhouse Orchards boasts a corn maze and hay rides during peak season. 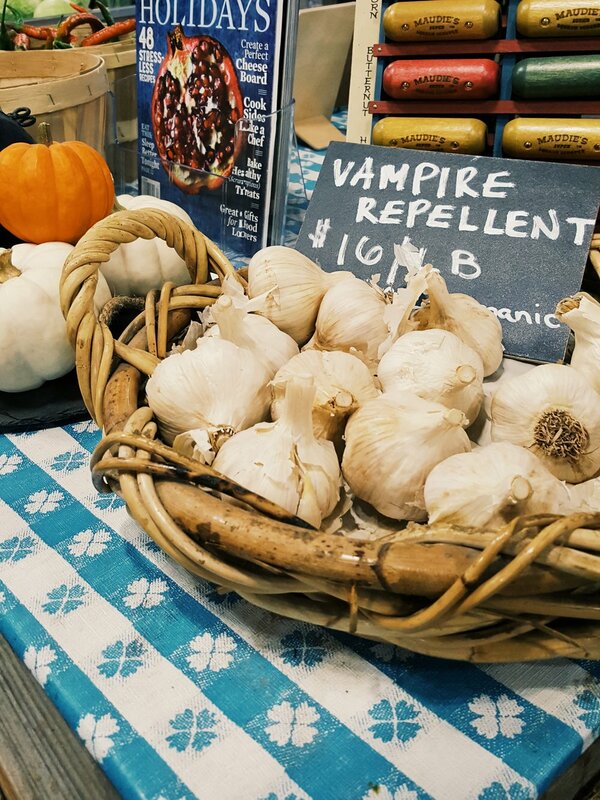 Sadly, weather prohibited us from going until the week just after what they consider peak season, but that didn't keep us from enjoying the pumpkins, hot apple cider, fresh pie (we bought a caramel apple - divine) and apples. There was a hay ride, but it seemed to be a pre-arranged group, because the driver disappeared into the woods after stopping the tractor. 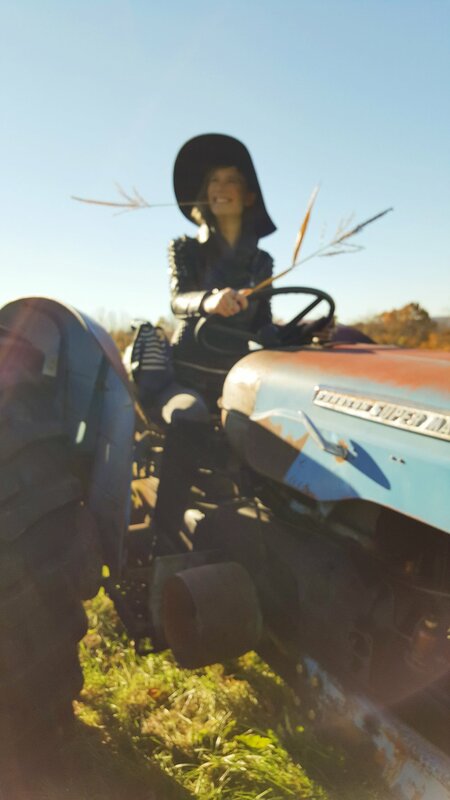 There was an awesome tractor sitting on the grounds, so I couldn't resist pretending I was driving it - in spiked pleather jacket, over-the-knee boots and giant black hat, of course. 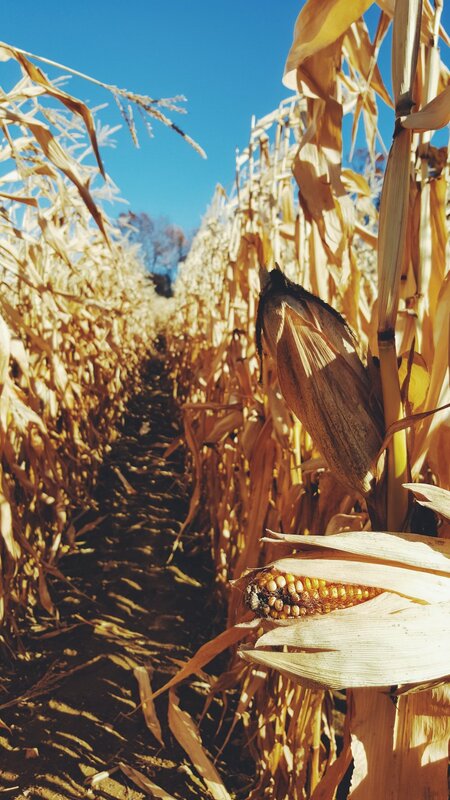 And, to our glee, the corn maze was still intact, but since it was "past season", we could sneak in for free, SWEET... as caramel apple pie. I love animals, and eating turkey, but I could not bear it for Thanksgiving after watching these guys hang out and interact. They are so sweet and funny. And the chickens, the colorful chickens roaming about freely! 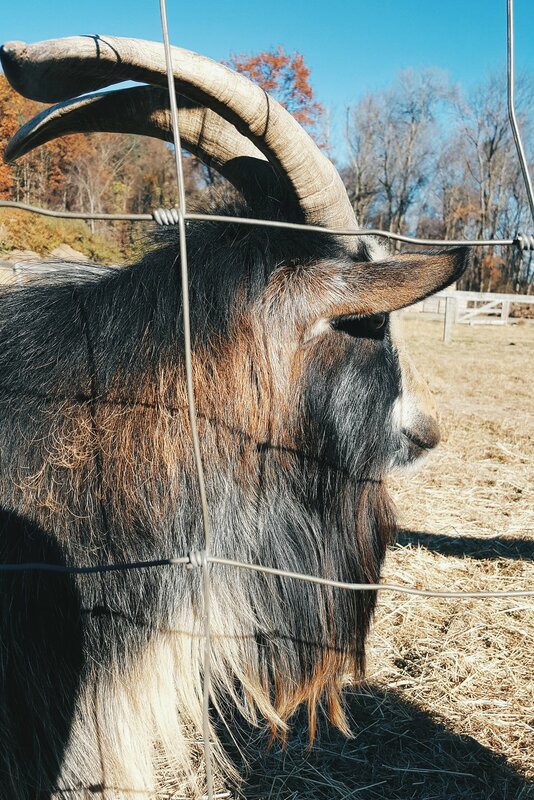 All of the goats, chickens and turkeys we found in these photos were at Harvest Moon Orchards. Harvest Moon, literally across the street from Outhouse (haha), is a bit more up-market, due to having a terrific little bar, with fantastic local spirits, attached to their general store. As it was after high-season - a blessing and a curse - we were not allowed in the orchard at Harvest Moon. We were told by the barman, that there is a beautiful view at the top, sigh. But we consoled ourselves by petting the surprisingly friendly goats nearby on the farm. The goats were so adorable and affectionate, I wanted one as a pet after about 5 minutes! Although we missed out on orchard bliss, we also consoled ourselves by enjoying the bar connected to the market there, trying great local cider flights in the sun. 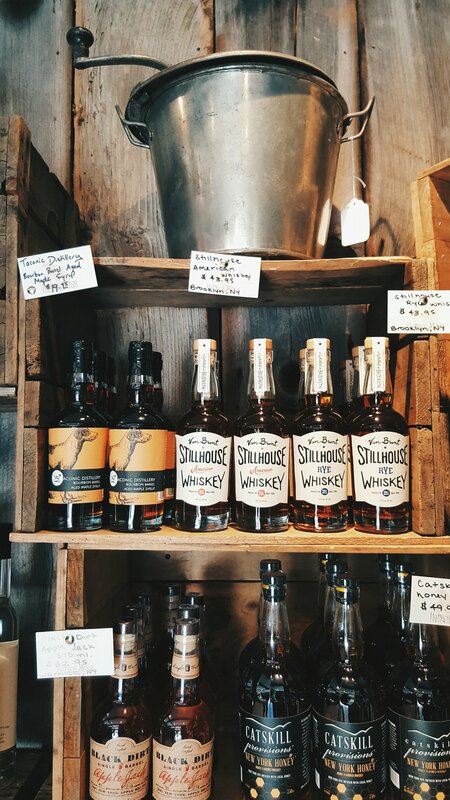 There were a plethora of fine options, but in the end, and without a car, we had to take home Neversink Spirits Aged Apple Brandy and Taconic Distillery Rye Whiskey - for some fine Fall beverages to remember them by once we returned to the city. Photos and video by Lauren Oosterlinck and Ben Edwards, 2016.